NATIVO LÓPEZ is president of the Mexican American Political Association and a spokesperson for the Great American Boycott 2006 — a national day of action for immigrant rights on May 1. Nativo talked about the huge protests against anti-immigrant legislation and plans for May 1 with SARAH KNOPP, a teacher in Los Angeles and Green Party candidate for state superintendent of schools in California. Where did these protests come from? They seemed to explode without anyone predicting it. Why are people so angry and ready to protest? I have observed that the current protests are the cumulative effect of years of bashing and denigrating immigrants generally, and Mexicans and Latinos in particular. But most poignantly, HR 4437 — the Sensenbrenner legislation — proposes to eliminate all social space within which undocumented immigrants could accommodate themselves, work, survive, and provide for their families. Their backs are against the wall, and we are now seeing a massive response — a fightback as never before. Not to be underestimated, however, are the cumulative effects of organizing, educating, agitating, etc. over the years, which allowed immigrants to have confidence in certain organizations to lead them into direct mass action. Some people say the compromise bill in the Senate is the best that we can expect and at least a positive step, as opposed to the Sensenbrenner bill. Do you agree? The Senate version has Sensenbrenner-type measures embodied in it, and therefore, we find this completely unacceptable and tantamount to compromising the social interests of all immigrants and all workers. I’m not convinced that this is the best that we can get or hope for. You get from life what you are ready to fight for. This is the message we have constantly conveyed to our base, and they have internalized this. They are ready and willing to fight for the whole enchilada. Why not? They have nothing to lose. What would be the effect of the three tiers in the Hegel-Martinez proposal? The three-tier legalization program offered by Hegel-Martinez in the Senate is a codified caste system — a sort of bantu apartheid system that is tacitly un-American and unacceptable. It would result in the complete division of families, and that’s why our families find it so repugnant and unacceptable. However, our greatest fear is that the Democratic Party will be unwilling to make a complete fight to oppose this version — in its haste to make a deal and impede the growth of this new civil rights movement. Second, there are already national “Hispanic” and other advocacy organizations moving in the direction of softening their position on the question. This is a danger that we must prevent. What do you think of the role of the LA Mayor Antonio Villaraigosa? And Cardinal Mahoney and some of the labor groups and NGOs? Mayor Villaraigosa has attempted to position himself as a centrist in the debate and has endorsed the McCain-Kennedy immigration proposal, which we find unacceptable. This is the Democratic Party’s answer to the Sensenbrenner bill. We believe that the people are willing to fight for more, and therefore, our demands are more far-reaching. The immigration debate must be resolved by immigrants themselves, and their voice must be paramount — not the voice of the hierarchies. Much of the leadership of such hierarchies have already accepted the compromise without a thorough consultation with the immigrant workers. I believe that this is wrong and elitist. Also, we recognize that much of this leadership is itself compromised by its ties to political parties, financial elites, and corporate/private foundation funding. They have inherent limitations which they never honestly divulge to the immigrant communities, or even to their respective base constituency. Many of the NGOs are not membership-based nor -driven, and therefore, operate from a different model of accountability. These are also their limitations in terms of the tactics they are willing to deploy. Why do all undocumented workers deserve legalization or amnesty? All undocumented workers deserve legalization because of their inherent contributions to this society. All workers create value in the process of production. They create wealth that is appropriated and used for other purposes, but never to completely remunerate them for their contributions. Value is never considered, nor designated, as illegal. Therefore, those who produce value cannot either be so designated or characterized. The value that immigrant workers create is actually greater than your average worker, because he/she is also denied many of the union-related benefits accorded to other native-born workers. The average number of years of an undocumented worker in the U.S. currently is five. We believe that for these reasons all undocumented workers have more than paid their way to legalization and deserve it immediately. Lastly, even if they did not have these number of years, due to the former argument of their role in the production process, if value is legitimized in this process, why should not the producer of such value be so legitimized — immediately upon his/her introduction into the production process? What’s the significance of the May 1 call? 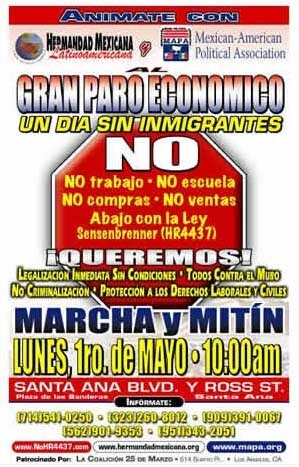 May 1st represents the ability of the immigrant worker to demonstrate his/her power in the economy and an exercise to show that his/her voice must be paramount in the national immigration debate. His/her absence from the workplace and consumption will send a powerful message to the political-economic elites that that immigrant workers must be taken into consideration and that the national corporate-funded agencies and organizations do not represent the immigrants. The political elite will have to contend with the immigrants on their own terms and turf. It will place the political elites in a situation of uncertainty — and herein lies the leverage that the immigrants can employ. It also rescues from anonymity the struggle for the 8-hour day by immigrants of yesteryear, and the glorious traditions of all working people in the U.S. and the world — of all races, nationalities, creeds, and flags. The voice of the immigrant will be heard around the world on May 1st. Some people have said that the May 1 action is “premature,” and that it will create a backlash. What’s your response? This is certainly a valid question. However, those who raise this concern have never been sympathetic to utilizing such tactics . They raise this concern in the abstract. But they have never employed the tactic in practice — therefore, their counsel must be measured by their historical practice. The use of such tactics are never universally accepted as viable by all political forces in a given social movement. This was demonstrated in South Africa, the 1960s civil rights movement, and others. Is there an ideal time to employ such tactics? It all depends on what workers are willing to fight for, and how they are willing to conduct that fight. Everything is a test of a theory, which will be validated by practice. We will see what the workers say on May 1st. What are you saying to the media types who suggest in their stories that “cooler heads” or more “realistic” political types — or people who bring up concerns about people being fired — are prevailing? We defend workers every day of the week against unjust dismissals. Those who raise such concerns have no real daily experience defending workers in such circumstances, and therefore, most of their utterings are merely patronizing. I say, let the workers decide what they are willing to fight for and how they desire to conduct that fight. They are not children who need to be coddled. The “cooler heads” are the ones most distant from the reality of the workers, and they did not have a clue about the millions people’s marches. What should people know about Anthony Soltero? 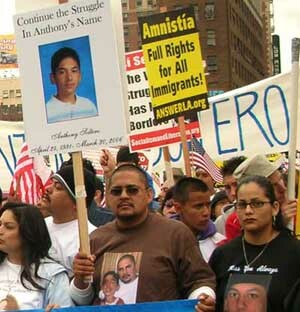 They should know that Anthony Soltero fought for his rights and the rights of others, and he was repressed by the school authorities, criticized by the corporate media, sent back to school by political leaders, chastised by adults, and patronized by too many other social hierarchies. He was the first victim and martyr of this new movement. What would justice for immigrants really be? What are possible next steps for the movement? Justice for immigrants would be the acceptance of the voice of immigrants as paramount in all debates about social policy and legislation — not much different from what is advocated for by women, gays, African-Americans, and other constituencies. Workplace justice, union organization, and collective bargaining agreements are a must in any equation of justice for immigrants. The next possible steps for the movement by immigrants is organization, organization, organization — of a permanent and politically independent character, where leadership can be developed, groomed, and prepared for the future fights that are sure to come. Lastly, I would like to acknowledge that much of the movement we are observing today is the legacy of Bert Corona, the modern-day pioneer of immigrant’s rights and organization in the U.S., and the founder of most of the mainline national Latino organizations and certainly those that currently fight for immigrant rights. He literally trained thousands of immigrants to fight, taught the value of political independence, the importance of building a base and constant consultation, and that the fight for immigrants’ rights must be conducted by the immigrants themselves. Much of the current leadership in the movement were students and disciplines of Bert Corona. This interview will be published in Socialist Worker next week. Thanks to Alan Maass for allowing MRZine to publish it now.